TABLE OF CONTENTS 06 Lake Sunapee Region The Lake Sunapee area offers a relaxed lifestyle with delicious dining and shopping in quaint New England villages. It’s a great place to visit and an even better place to live. 42 Land — Lake Sunapee Region Quality land parcels with breathtaking views. 44 The Lakes Region The Lakes Region of New Hampshire is home to the state's largest lake, Winnipesaukee, which attracts a vibrant group of year-round fun-seekers. More than 273 lakes dot the landscape, including Squam Lake, Waukewan, Winnisquam and Wentworth. Quality land parcels with breathtaking views. 67 Land — Squam River Landing Sustainable living community overlooking the Squam Watershead and mountains. 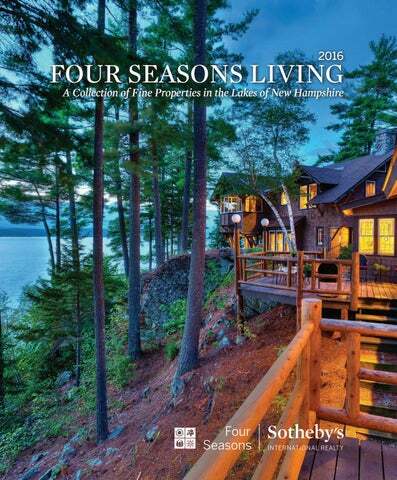 e are proud to bring you a selection of the finest properties throughout the New Hampshire Lakes Region, in our annual edition of our Four Seasons Sothebyâ&#x20AC;&#x2122;s International Realty Living Magazine. LAKE SUNAPEE REGION Explore our selection of homes currently for sale in the Lake Sunapee Region. HANOVER, NEW HAMPSHIRE Private Hillside Retreat in Hanover Enjoy a picturesque, panoramic Green Mountain vista, ideally sited on 7.9 private acres less than 10 minutes from the College and DHMC. LAKES REGION Explore our selection of homes currently for sale in the Lakes Region. LAKES REGION MEREDITH, NEW HAMPSHIRE Prestigious Winnipesaukee Waterfront This unique Georgian style residence sits on 3.09 acres with 200 feet of frontage on prestigious Veasey Shore's Gold Coast and is located less than five miles to downtown Meredith. The ultra private lot features mature landscaping, lush lawn, patio, two decks, and a 50 foot deep water dock. The home boasts over 7,000 square feet of living space in 17 rooms featuring a custom library, an expansive kitchen, a formal dining, living, three season, family, and sun rooms.. This high quality home was built for year round living while providing the excitement of living on NHâ&#x20AC;&#x2122;s largest lake. LAKES REGION TAMWORTH, NEW HAMPSHIRE Secluded Country Retreat "The Clearing Farm" - a magical enclave tucked away from view on Tamworth's famed Cleveland Hill, available for only the fourth time since 1750. Once the retreat of famed Boston architect Walter Kilham, this 64 acre secluded wooded parcel with magnificent 180 degree ever changing views from Mount Chocorua to Whiteface has just 4 acres open in the center, cradling the main house, guesthouse, barn, writers studio and private swimming pond. The long driveway allows you to transition from the picturesque and quiet gravel road into a private sanctuary where no neighbors can be seen or heard. The Marina offers day docking, boatslips, boathouses, and a valet service with dry berths. The Community Center and roof top deck are available for use as well as the town beach on Little Squam which is located at the base of the development. FourSeasonsSIR.com Each Office is Independently Owned and Operated. Sotheby's International RealtyÂŽ affiliates of New England. Local expertise, regional network, global connections. 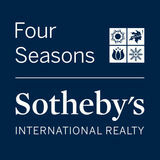 THE FOUR SEASONS SOTHEBY’S INTERNATIONAL REALTY APP IS AVAILABLE. GAIN ACCESS TO VERMONT AND NEW HAMPSHIRES FINEST REAL ESTATE — ALL AT THE TOUCH OF YOUR FINGERTIPS. To download this app, visit the App Store and search VT NH Real Estate.